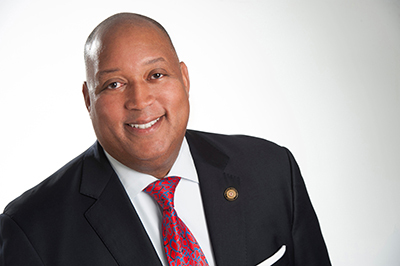 GREENSBORO, N.C. (April 13, 2018) – North Carolina Agricultural and Technical State University alumnus and North Carolina state Sen. Joel Ford will deliver the keynote address for the spring undergraduate commencement exercise, school leaders announced today. The ceremony is set for 8:30 a.m., Saturday, May 12, 2018, at the Greensboro Coliseum. Ford ’92 represents District 38 in Mecklenburg County and is also a healthcare executive consultant for a behavioral health company. After earning his bachelor’s in business administration, he began his career at Waste Management of Atlanta, Georgia. Ford later developed a business plan to create his own waste management company while working as a substitute teacher in the Charlotte-Mecklenburg Schools. As a past chairman of the Charlotte Housing Authority, Ford championed multiple initiatives that included securing funding to create and operate the Renaissance West Initiative to revitalize former public housing. The project features an early childhood education center, a high-performing public school and affordable senior and workforce housing. He also formed partnerships to help eradicate homelessness and to create the Center for Employment Services. He served as a member of the Stratford-Richardson YMCA board of directors and as chairman of the Mecklenburg County Democratic Party. Currently a member of the N.C. A&T Board of Visitors, Ford is a graduate of the Institute of Political Leadership and the Leadership North Carolina Class XI. For the graduate commencement exercise, Intel Chief Technology Officer Michael C. Mayberry, Ph.D., will deliver the address. The ceremony begins at 1 p.m., Saturday, May 12, 2018, also at the Greensboro Coliseum. In his role at Intel, Mayberry serves as a senior vice president and managing director of Intel Labs where he is responsible for global research efforts in computing and communications. He also leads the Corporate Research Council, which drives allocation and prioritization of directed university research across the company. Mayberry joined the Intel team in 1984 and has held various positions. He received his bachelor’s degree in chemistry and mathematics from Midland College and his doctorate in chemistry from the University of California, Berkeley.